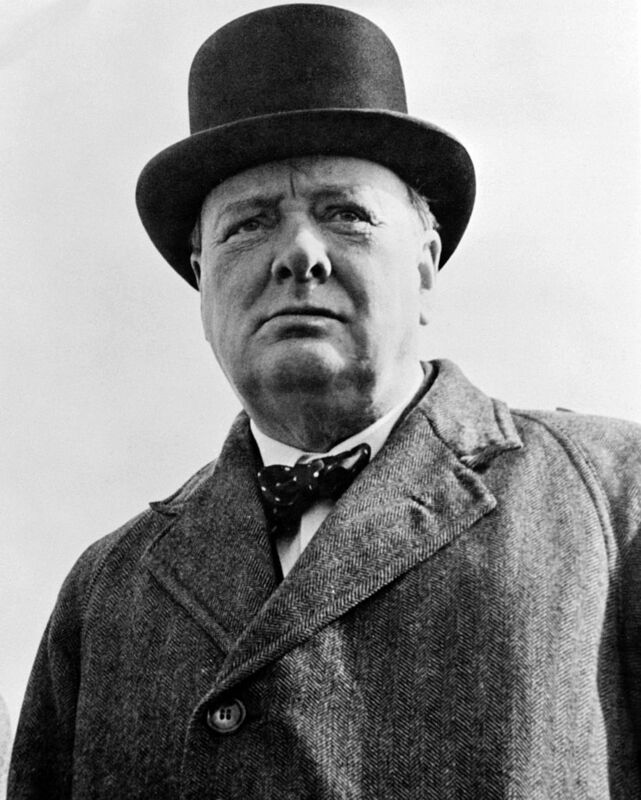 Sir Winston Churchill (30 November 1874 – 24 January 1965) was a British politician and author, best known as Prime Minister of the United Kingdom during the Second World War. Churchill was famous for his stubborn resistance to Hitler during the darkest hours of the Second World War. Winston was born at Blenheim Palace, Woodstock near Oxford to an aristocratic family – the Duke of Marlborough. He was brought up by servants and friends of the family. He rarely spoke to his father, and he spent most of his childhood at boarding school – Harrow. Churchill wasn’t the best student, having a rebellious nature and was reportedly slow to learn; but Churchill excelled at sports and joined the officer cadet corps, which he enjoyed. On leaving school, he went to Sandhurst to train as an officer. After gaining his commission, Churchill sought to gain as much active military experience as possible. He used his mother’s connections to get postings to areas of conflict. 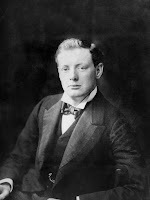 The young Churchill received postings to Cuba and North West India. He also combined his military duties with working as a war correspondent – earning substantial money for his reports on the fighting. In 1899, he resigned from the military and pursued his career as a war correspondent. He was in South Africa for the Boer War, and he became a minor celebrity for his role in taking part in a scouting patrol, getting captured and later escaping. He might have gained the Victoria Cross for his efforts, though officially he was a civilian at the time. After this experience, he gained a temporary commission in the South Africa Light Horses and later commented he had a ‘good war’ while continuing his work as a war correspondent. Churchill returned to the UK in 1900 and successfully stood as a Conservative candidate for Oldham. After becoming an MP, Churchill began a lucrative speaking tour, where he could command a high price for his speeches. In 1904, he made a dramatic shift, leaving the Conservative Party and joining the Liberal Party. He was later often called a ‘class traitor’ by some Conservative colleagues. Churchill disagreed with an increasing amount of Conservative policies, including tariff protection. Churchill also had some empathy for improving the welfare of the working class and helping the poor. In the Liberal Party, Churchill made a meteoric political rise. By 1908, he was made President of the Board of Trade, and he was a key supporter of Lloyd George’s radical People’s Budget – a budget which saw the growth of an embryonic Welfare State and introduction of income tax to pay for it. The budget made a significant improvement to the life of the poor and helped to address the inequality of British society. However, although Churchill was a Liberal, he was also staunchly anti-Socialist and suspicious of trade unions. During the General Strike, he took a hardline stance to defeat the unions at any cost. In 1911, he was made First Lord of the Admiralty – a post he held into the First World War. On the outbreak of hostilities in Europe, Churchill was one of the most strident members of the cabinet arguing for British involvement in the war. In August 1914, the Liberal cabinet was split with some members against going to war on the continent. However, Churchill’s view prevailed, and he admitted to being enthused about the prospects of being involved in the ‘Great War’. He went to Belgium where he urged the Royal Marines to commit to action around Antwerp. This decision was criticised for wasting resources. Others said it helped saved the channel ports from the advancing German army. Churchill also used naval funds to help develop the tank – something he felt would be useful in the war. However, despite tremendous eagerness for war, his flagship policy for the war was deemed a failure. Churchill planned the 1915 Dardanelles Campaign – a daring bid to knock Turkey out of the war. But, unfortunately, it proved a military failure with thousands of Allied casualties and no military gain. Although the fault of the failure was shared amongst others, Churchill resigned from his post and sought to gain a position in the army on the Western Front. After seeing relatively little action on the Western Front, he returned to London and sat on the opposition benches before joining Lloyd George’s coalition government. In 1917, Churchill was made Minister of Munitions – a job requiring strong administrative skills to manage limited resources during the war. Churchill was considered an efficient and skilled minister. At the end of the First World War, Churchill was active in trying to support the Russian white army – who were trying to resist the Communist forces which had gained control over the Soviet Union. In 1924 Churchill was appointed as Chancellor of the Exchequer by Conservative PM Stanley Baldwin. Under advice from many economists, Churchill made the decision to return Britain to the Gold Standard at a pre-war level. But, this proved to be damaging to the economy and led to a period of deflation, high unemployment and low growth. Churchill later admitted this was his greatest domestic mistake. The low growth and declining living standards contributed to the General Strike of 1926 – Churchill eagerly sought to break the strikers and defeat the trades unions. During this period he expressed admiration for Mussolini for being a strong leader. In the 1930s, his political eccentricities consigned him to the backbenches, where he was a vocal critic of appeasement and urged the government to re-arm. Churchill was often a lone voice in speaking about the growing danger of Hitler’s Germany. He also opposed Indian Independence and was a staunch supporter of the Empire. After an unsuccessful start to the Second World War, the Commons chose Churchill to lead the UK in a national coalition. Churchill was instrumental in insisting Britain keep fighting. He opposed the minority voices in the cabinet seeking to make any deal with Hitler. Churchill proved an adept war leader. His speeches became famous and proved an important rallying cry for a country which stood alone through the difficult years of 1940 and 1941. These early years saw the Battle of Britain and the Blitz – a period where invasion by Germany seemed likely. After the US entry into the war in 1942, the immediate crisis was over, and the tide of war began to turn. After the Battle of El Alamein, Churchill was able to tell the House of Commons. From 1943 onwards Churchill spent more time managing the uneasy Allied coalition of Soviet Union, US and the UK. Churchill was involved in many aspects of the war, taking an interest in all areas, especially the build up to the D-Day landings in Normandy. Churchill also participated in conferences with Stalin and Roosevelt which helped shape the war and post-war settlement. With American money, Churchill played a role in avoiding the mistakes of the First World War as the Allies sought to avoid a harsh settlement and rebuild occupied Europe. It was Churchill who helped popularise the phrase ‘Iron Curtain’ after he saw the growing gulf between the Communist East and Western Europe. After winning the Second World War, Churchill was shocked to lose the 1945 general election to a resurgent Labour party. He was Leader of the Opposition from 1945-51. Churchill was awarded the Nobel Prize in Literature in 1953 “for his mastery of historical and biographical description as well as for brilliant oratory in defending exalted human values.” Towards the end of his life, Churchill became an accomplished artist, though he found the years of retirement difficult and suffered periods of depression. Churchill died in his home at age 90, on the morning of Sunday 24 January 1965. His funeral was the largest state funeral in the world, up to that point in time.